Hapimag has announced that the construction work at the new city residence in Salzburg will soon be finished and members will be able to stay at the high-class and stylish apartments in the city of Mozart earlier than planned. The city residence is located in the city centre directly on Brodgasse – the famous festival theatres and the cathedral are just a stone’s throw away. 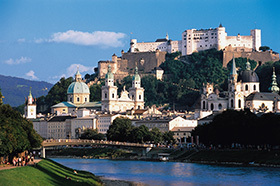 It is the ideal starting point for exploring the dreamy city of Mozart and its many attractions. Here, members can experience art and culture at first hand, stroll through picturesque alleys and immerse themselves in the world of classical music. The style of the city residence is inspired by Mozart and Salzburg as a stage and theatre city. The apartments have cream and grey tones and are bright, classy, elegant and chic – a baroque ambience in modern materials. Hapimag purchased the property for the new city residence in Salzburg in 2008 and extensive renovations have been underway for just under a year. The construction work has, however, proceeded so fast that the twelfth Hapimag city residence will be available to members earlier than planned.